What feels like ages ago, my cousin requested I make something with cherries. I came up with several ideas, unfortunately when it came time to make the item at the top of my list the weather wasn’t cooperating. The forecast warned of high temps and equally high humidity. That is not the kind of day I want to be traveling with frosted anything and especially not a day I want anything frosted sitting out long. The pretty frosting will surely lose it’s form and very quickly begin sliding around. It was a fear, a very valid fear that I did not want to deal with. Fast forward over a month later. Time for a birthday bash. A perfect time for lots of desserts, as froofy as I desire. 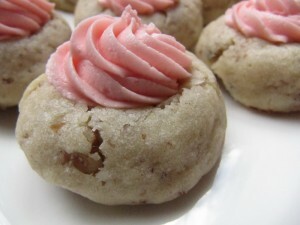 I had my heart set on making pecan cherry thumbprint cookies. Thumbprints are fun to make, giving you loads of possibilities. The fillings can range from simple to elaborate, flavored frostings, chopped fruit, jam, you name it! My plan was to make two different varieties of thumprints, which I did but the cherry variety turned out far tastier. Instead of following the original recipe I altered another thumprint recipe I have made several times in the past. Since I knew this recipe was a winner, it seemed like a good and safe bet to use in place of an unknown. Sometimes the idea of trying something new, not knowing if it’s really going to turn out is scary. I almost always have a backup plan just in case the worst happens, but in this case it wasn’t necessary at all. I had faith in my altered recipe. And thankfully it absolutely paid off. The cookie was changed into a delicious pecan cookie. They are loaded with flavor from the chopped nuts. Prior to frosting the cooled cookies, you leave a neat little surprise of sliced cherries. Top them off with a cherry flavored frosting. 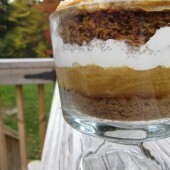 Simply delicious and super easy. They’re slightly more time consuming than your average cookie, but well worth the effort. These are best for a party as you wouldn’t want to sit and indulge in the entire platter yourself, though you certainly could. In a stand mixer or large bowl, cream butter. Scrape down your bowl. Add sugar and salt, mix well and scrape the bowl again. Always scrape prior to each new addition. Add egg and vanilla. Mix until smooth and blended. Add flour 1/4 cup at a time, mixing until all flour is added. Toss in pecans, mix until the pecans look evenly dispersed throughout your dough. A note on the pecans - make sure to not leave any large chunks. The pecans should be very finely chopped down. If you do not have a food processor, use the flat side of a meat tenderizer or a rolling pin to hammer the pecans into small bits. Cover bowl and chill for at least 1 hour. Preheat oven to 375. Form 1" balls of dough using a medium cookie scoop, then roll to shape into a smooth ball. Place on a silpat lined baking sheet. I was able to fit 15 dough balls on my sheet. If you don't have a baking mat, get one. They're amazing. The same goes for an array of cookie scoops, they can be used for so much. Bake for 8-10 minutes. Using a measuring spoon, press down carefully on each cookie to form an indentation. It's okay if they crack a bit around the edges. Some will crack more than others. Transfer cookies to a wire rack to cool completely. Alternately, though I have not personally tried this method, indentations can be made prior to baking. I plan on trying this at some point to see which method is best. If you have tried this or do try this, be sure to let me know which method you prefer. I have recently wondered if it is easier to punch down the ball prior to cooking and if the baked cookie turns out the same or not. Slice cherries. You can also do this as you go so you don't waste cherries by slicing too much. Carefully spoon cherries into indentation of each fully cooled cookie. In a medium or large bowl, cream butter. Slowly add 1/2 cup powdered sugar at a time to butter. Mix well. Scrape your bowl often. Add cherry syrup. Mix until piping consistency. If you need to add more liquid, milk or more cherry syrup should be added in small portions until you are satisfied with the thickness. To make a brighter pink or red, simply add icing color. A little goes a long way. Always remember to avoid liquid food color as it will change the consistency of anything you are working with. Icing color can easily be found at any craft store. Add your chosen tip to a decorator bag, then fill with the frosting. 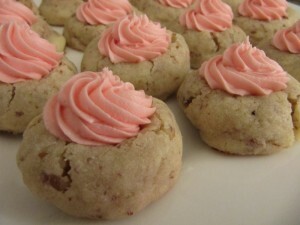 Top off each cookie with a cute swirl of pink cherry flavored frosting. Store in an airtight container if not eating immediately. These look delicious to me. One of my favorite holiday cookies is one that my Mom always made… a butter cookie w/ a maraschino cherry pressed into the top. 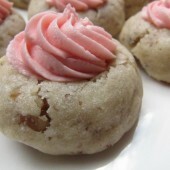 That maraschino cherry juice is so good w/a buttery cookie! I just found this recipe while searching for a maraschino cherry thumbprint recipe. I am excited to try it! I am curious what other type of thumbprints you tried to make (the ones that weren’t successful). I made these for Easter and they turned out perfect! 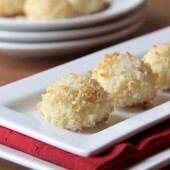 Thanks for a delicious recipe that reminds me of a child hood favorite I always made with my Grandmother! I’m so glad to hear you enjoyed them. :) Thanks for letting me know! Have a great weekend.